With the NHS being the victim of funding cuts from left, right, and centre, it’s no wonder that the quality of health care patients are receiving is rapidly diminishing, and that the number of full time GPs is declining year on year. The National Association of Sessional GPs conducted a study at the start of 2018 that roughly determined the number of Sessional GPs in the UK – a record 22,500, which accounts for 40% of the UK’s entire GP workforce. 17,190 of these are locums, which leads us to the question: Why are GPs becoming locums? Before deciding to throw in the towel as a full time GP or partner, there are a few things you need to know about becoming a locum and what the job actually entails. For starters, what is a GP Locum? A locum GP is a fully qualified GP that fulfils the duties of another, absent, GP within a hospital or doctors surgery. The main difference between the two is that locum GPs travel from one doctor’s surgery to another in order to assist them with under-staffing, whereas, full time GPs are employed by or in partnership with one practice only. What’s the earning potential of locums? Due to the fact that locums are available at short notice and have to travel from one job to the next, they are given a much higher hourly rate of pay. In fact, 1 in every 30 UK locums earns £120 per hour, almost £110 more than the average £10.88 paid to a full time GP. How flexible is the role? 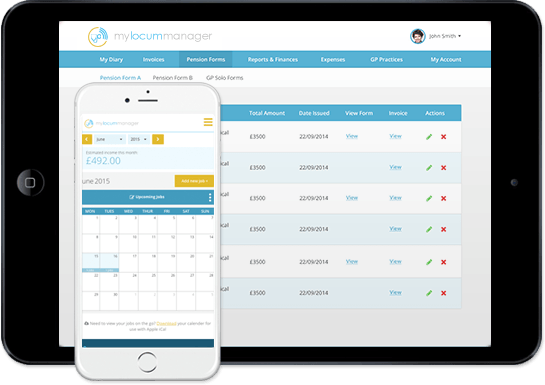 Along with having the ability to earn more over the course of the year, locums also have complete control over when and where they work. Some choose to take on as many shifts as possible, others opt to work a few days each week and enjoy having more free time. This makes it a brilliant option for working parents who struggle getting childcare, as well as GPs that would like to reduce their hours. Due to the fact that GP locums aren’t employed by particular practice, they’re not contracted to a specific number of hours. This means they aren’t guaranteed any work each week which, for some people, doesn’t provide enough job security. One thing to bear in mind though is that GPs are always required and therefore, you’re unlikely to run out of work. One of the main disadvantages for GP locums is that they aren’t able to get to know individual patients or their medical history – and many don’t get much time to read patient medical records before appointments. This can be frustrating for both parties, although, most patients feel comfortable seeing a different GP each time they attend an appointment. Entering a new working environment can be a little daunting, although, because of the increased pressure on doctors’ offices, locums are expected to get familiar with the procedures and systems of each practice fairly quickly. This is usually one of the most stressful parts of working as a locum, however, full time practice staff are generally happy to offer guidance. In order to make regular contributions into your NHS pension when working as a locum for the NHS, you are required to complete ‘GP Locum A and B’ forms. The purpose of form A is to certify that work was completed at a practice, and to record how much was earned. Form B contains information about your employee pension contribution along with employers contributions received from practices. Organisation is another issue the locums are regularly faced with. From monitoring income and the number of hours worked in each practice, to sending out invoices and filling out pension forms, there are a number of reasons locums need to be organised. On the plus side, there are online management tools available, such as My Locum Manager, which assists in keeping track of everything. When it comes to the correlation between locum GPs and the National Health Service, it really is a continuous cycle: GPs are leaving the NHS to become locums because of funding cuts and high workloads, and low wages; the NHS is then using locums to meet the demand for GPs and is therefore paying more for less staff. Does this mean that the underfunding of the NHS is partially to blame for the lack of salaried GPs? Jeremy Hunt took on the position of the UK’s Health and Social Care Secretary in 2014. So far, he’s removed a whopping £4.3B from NHS England’s capital budget that is now instead being used to pay for daily running costs. Between 2016 and 2017 alone, he took £1.2B – 20% of the entire capital budget. A different analysis of NHS finances, conducted by the Health Foundation, found that capital spending for healthcare in the UK is below average compared to other OECD countries: 0.3% of GDP when the average is 0.5%. It’s because of this that many hospitals are now struggling to afford the scanners and surgical equipment they require to treat patients with cancer and other diseases. Instead, they have to use vital diagnostic and treatment technology that is no longer at optimum performance. Once example of this was a case in which 200 patients had to be rescanned because the images taken of their lumps, tumours, and broken bones were unclear and impeded correct diagnosis. One trust was faced with needing £40M of urgent repairs and new equipment within a year, when only £11M was available for them to spend. It’s these severe cuts that are leading trust bosses to worry that the lack of funds for repairs and new equipment is beginning to negatively affect the quality and safety of patient care. In response to the growing workload pressures, cuts to funding and stressful working environments, the number of GPs leaving the UK workforce and becoming locums is rapidly increasing every year. If the number of salaried GPs and GP Partners continues to drop, the NHS will be relying on locums more than ever. This means the NHS will be paying much higher rates for qualified GPs, increasing the annual NHS spend by millions each year, and therefore having an adverse affect on the health care system as a whole. On May 29th 2018, NHS England announced a new £10m fund that would be used to try and support and retain General Practitioners. £7m of the fund is focused on regional-based schemes that aim to keep GPs in the workforce, encourage different ways of working, and to offer further support through a new Local GP Retention Fund. The purpose of the fund is to support local health services that are focusing on assisting newly qualified general practitioners in their first 5 years of practice, GPs that are considering leaving the workforce, and those that are planning to no longer practice in the NHS. NHS England will also be investing a significant amount into attracting new GPs to local practices, offering more placements, and recruiting 2,000 GPs by 2020. This is in addition to the GP Retention Fund. So, after looking at all the reasons salaried GPs and GP Partners are becoming locums, what’s the bottom line? Well, it seems that the root of the problem begins with the massive funding cuts issued by politicians and health secretaries, and the impact that they’re having on medical professionals in both hospitals and GP practices. Currently, it seems to be a never ending cycle of budgets being reduced, GPs leaving to become locums, and the NHS paying out millions to locums in order to cover gaps in staff.